The kingdom of Grandbell had been at peace for many years. Without warning, the armies of Prince Gandolf of Verdane descended on Jungby Castle, and the troops kidnapped Lady Edin. News quickly spread of the invasion, and several groups of resistance set out to save the land. Lord Sigurd of Chalphy is the first on the scene. Is there a possible link between these events to the ancient Dark Lord Loptos? As Lord Sigurd's armies, your aim is to clear the enemy troops, gaining experience. The game is separated over two major time periods. The characters you play as in the first half can converse on the battlefield. If a male and female character fall in love, then their child will appear in the second part. At the Thracian river, Amid and Linda meet a man named Jake, who first appeared in Fire Emblem: Dark Dragon & Sword of Light (NES 1990). 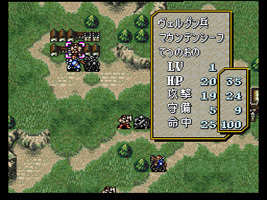 Wait in the Arena for around 30 seconds and the map music from Fire Emblem: Mystery of the Emblem Book 1 will play.